This Home Spa Beauty Box was part of the Vegan Cuts Beauty Box Vault Opening Sale back in September and is still available now. It makes a great gift for the lady or guy in your life who likes to pamper themselves! The Vegan Cuts Yoga Box is filled with products to enhance and support your yoga practice. Discover everything from chakra teas and bracelets to healthy snacks and aromatherapy. This gorgeous faux leather bag comes with four interchangeable flaps in black, red, white and silver, as well as a removable shoulder chain. To purchase, follow this link, then click “Fashion” and you will see this clutch plus many other stylish bags to choose from! 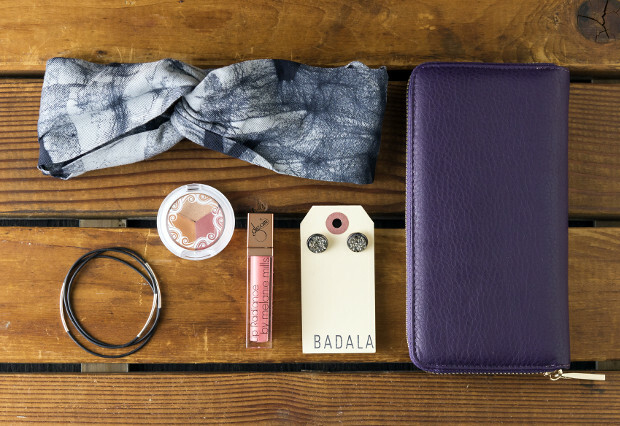 The Fall/Winter edition of the Vegan Cuts Style box includes more than $150 worth of cruelty-free products like Badala earrings, a Della headband, and Pacifica eyeshadow. I wrote a post about this box a couple months ago. This gift is perfect for chocolate lovers who are avoiding dairy, eggs, nuts and gluten! Premium Chocolatiers carries allergy-friendly treats that taste so close to the real thing, no one will know they’re allergy-friendly and cruelty-free. To purchase, follow this link, then hover your mouse on the word “Shop.” Under “The Perfect Vegan Gifts” you’ll see the photo of the stocking with chocolate and you can click it to go to the order page. Which items catch your eye? Will you be purchasing any of them this holiday season? PS a Vegan Cuts Snack Box subscription or a Vegan Cuts Beauty Box subscription make great gifts that keep on giving after December ends with monthly boxes delivered to your recipient’s door.